Laughter is really more of a bonding facilitator than it is necessarily a pure byproduct of humor. A common example of this phenomenon is manifested daily in cinemas all over the World. When the same comedy is played, people always laugh more when the theater is crowded - compared to when it's sparsely filled. There are several body language gestures which can accentuate this laughing-bonding-rapport building process. 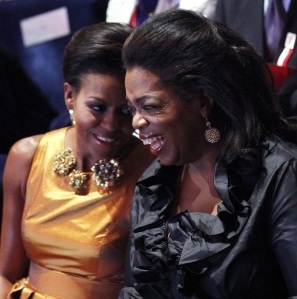 A very common one is demonstrated here between U.S. First Lady, Michelle Obama and Ms. Oprah Winfrey. As bouts of laughter are near maximum crescendo as well as their peak, it is very common for those laughing to subconsciously reduce their interpersonal space. This is very often and sincerely manifested nonverbally by a leaning of the head(s) and upper body towards the other person. It often is mutual and simultaneous. Sometimes during extreme laughing bouts there may even be a touching of heads. This head tilt is significantly more common and pronounced with women compared with men.